While this year's three new iPhone models have been leaking a lot as we get closer to the September 12 event during which they'll get official, there's been some controversy around their names. Not anymore, according to a new report from 9to5Mac. The successor to the iPhone X, with its similar looks and 5.8" touchscreen, will allegedly be called iPhone XS. This is a certainty, apparently. 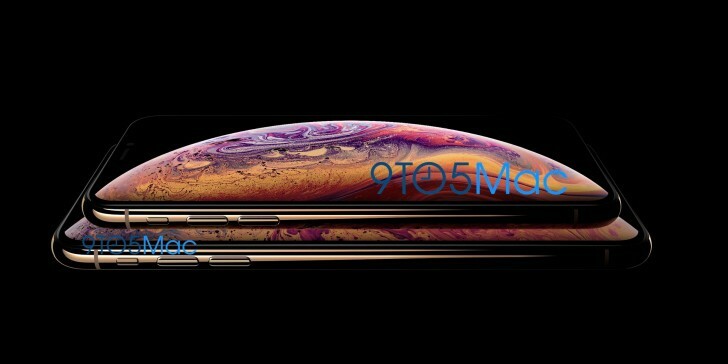 What's less clear is what the bigger, 6.5" model will be called - iPhone XS Plus perhaps? Anyway, here they are, one on top of the other, in the first leaked render depicting two thirds of Apple's 2018 iPhone lineup. Both of these models will have similar specs, including dual rear cameras, stainless steel frames, glass backs, AMOLED screens, and internals - including the A12 chipset, 4GB of RAM, and 64/256/512GB of storage. Today's report says they will both be offered in gold, a color that isn't an option for the iPhone X. The third model will be cheaper, with a 6.1" lower-res LCD display and aluminum chassis, a single rear camera and only 3GB of RAM. Feel fee to list your iOS11 problems here and we will verify them? Why was there no iPhone 9? Cause iPhone 7 8 9.